a Skilled Regional Sponsored Visa - Subclass 487This is a TEMPORARY (or "PROVISIONAL") visa which leads to a Permanent visa. It has the same Points Test pass mark as the Skilled Sponsored Visa, but the pass mark is easier to reach. It then gives you 3 years to meet the requirements for a permanent visa which will not be Points-Tested. You must be sponsored by an eligible relative living in Australia or obtain nomination from a participating State or Territory government agency. Click for details..
Click on any of the visa titles above for further information. 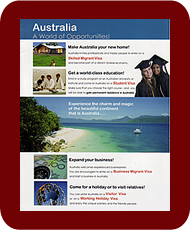 Some international students currently in Australia may feel frustrated because they have invested a substantial amount of money, time and effort in several years of study in Australia, in the hope of settling here on completion of their studies, only to find that they can only apply for the Skilled Graduate Visa - Subclass 485, which allows them to stay in Australia for a further 18 months with full work rights, but without a pathway to permanent residence. for 4 years, if you have gained a Doctorate degree in Australia. To be eligible for a Subclass 485 visa, allowing an 18-month stay in Australia, you need to be able to nominate an occupation listed in the SOL current at the time of your application. To be eligible for a Post-Study Work Visa, the only requirements are that you have a completed a Bachelor, Master or Doctorate degree in Australia and that you have an IELTS score of 6 in all components: you will not be required to nominate an occupation on the SOL. If you are considering applying for a Subclass 485 Visa or a Post-Study Work Visa and want to explore whether you can gain Permanent Residence in another way, send us an email with an explanatory note and with your Curriculum Vitae or Resumé as an attachment. Or call AMES on 61 8 8410 6262 to make an appointment.